As I enter into my fourth week post-partum I am struggling to find the balance between physically letting my body recover the way it needs and mentally keeping myself from pushing too hard too soon. I’m also trying (obsessing perhaps) to figure out the best way to running and cross-training. The rest of the week will include one more power walk at 3.1 miles, more leg, core and pelvic work and I’d like to try a bike ride or spin class. It is probably worth noting that my work-outs leading up to delivery included a weekly spin class until 36 weeks; weekly “circuit” sessions of rowing, core and arms; yoga; and 1-2 weekly swims. The week before A was born I’d done one of my circuit sessions and a yoga session. The only thing I hadn’t maintained was running or walking. As much as I’d love to be like this badass running mama and have returned to running days after birth, I have to remember that everyone is different and I have to listen to my own body. I knew from the first walk that I would need a solid 4 weeks to be able to rebuild simply the motion (and hopefully muscle memory!) of walking and then running. Today’s walk was the best I’d felt yet and I’m eager to try a slow, run/walk jog next week. 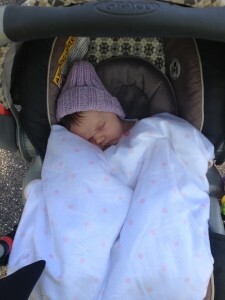 But starting with these first few weeks of walking is definitely mission critical. By week 6 post-partum I hope to return to running with the same schedule of 3 days a week and ideally maintain cross-training two days a week. This was my routine during my last round of training and it seemed to work well with both family/work schedules and run performance. Which is why strength training is key. I’ve lost a little strength (I think) in these first few post-partum weeks because I focused all my energy into the walks. Now on week four, however, I am ready to work back in upper body, lower body and core strength work. I know my pelvic floor needs strengthening and I know that kegels are key to making this happen. For the life of me though, I find kegels not only hard to do (I literally cannot tell if I’m ever doing them right) but hard to remember to do. Now I try to lay on the floor with baby A and when she has tummy time I do kegels. As eager as I am to not only return to running but also to training I’ve really pushed myself mentally to plan out a realistic return. Plenty of runners advise (and I agree) to register for a race so there is a goal to work toward. In my case, that race is the Chesapeake Bay Bridge 10k on November 9 which I happened to have registered for long before I was even pregnant. Throughout these first weeks I have reset my expectations several times for this race. Knowing that I will not be actively running, let alone training, until 6 weeks post-partum that will give me a whopping 4 weeks to “train” for the 10k. In my stubborn and over-confident way I find myself believing half the time that I will have no trouble not just running the race but running it fast. The other half the time I admit there is a strong chance I will employ a walk/run strategy (thinking 1 min walk/3 mins run). But the real planning I’ve been obsessing over is how to return to marathon training. Best case scenario my entry to the 2015 Boston Marathon is accepted and I will need to be race ready (distance, speed and strength) by April 20. I initially did not think this was possible but again, I reset my plan and my expectations. If I get in, I would like to do a 12 week training plan which would start end of January. I will need to significantly rebuild my base which I have essentially already started and that I can ramp up in November. I was originally getting sidetracked by the prospect of other winter races but realized if I focus on the one, singular goal of preparing for Boston then I have plenty of time and should be able to race with no problem. If I don’t get in, I will simply re-reset my plan with new goals (including a new a BQ race!). Regardless of what happens, the return to running–like so many things about running–will be all about my mental focus. Keeping up with running with one child was hard enough so I know with two it will be even more difficult. It will mean that I HAVE to win over the snooze button! It will mean that I have to adjust training when kids are sick or schedules change. And for my own sanity, it simply means that I MUST RUN. This entry was posted in Running and tagged 10K, Marathon, running pregnant on September 24, 2014 by Natalie.